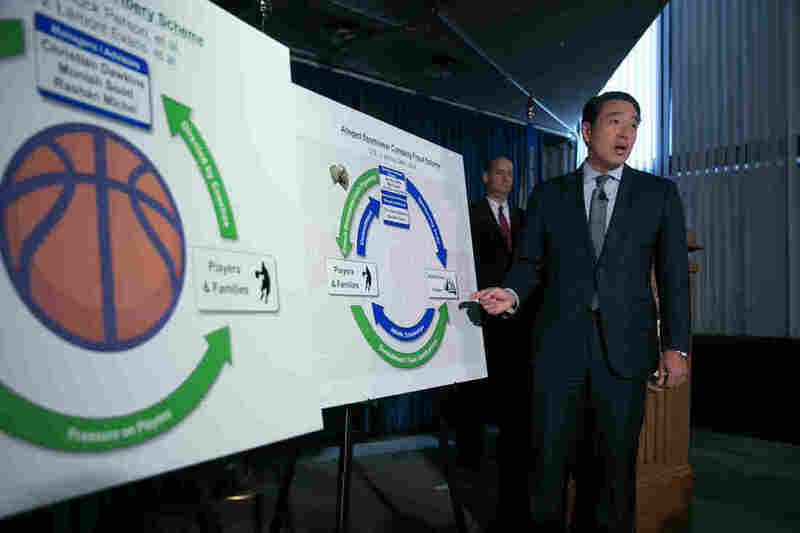 4 College Basketball Coaches Arrested In Bribery Case; Adidas Exec Also Named : The Two-Way The case exposes the "dark underbelly of college basketball," Acting U.S. Attorney Joon H. Kim of the Southern District of New York said. Acting U.S. Attorney Joon H. Kim speaks during a press conference at the U.S. Attorney's Office, Southern District of New York today. The acting U.S. Attorney announced Federal criminal charges against ten people, including four college basketball coaches, as well as managers, financial advisors, and representatives of a major international sportswear company. Describing the "dark underbelly of college basketball," Acting U.S. Attorney Joon H. Kim of the Southern District of New York said investigators believe bribes were paid to lure top recruits to elite programs — and to affiliate those players with sportswear deals at those universities. Other payments were made to coaches so they would steer young players toward financial and business advisers, in what Kim called an abuse of trust. "In exchange for bribes ranging from $13,000 to almost $100,000 each," Kim said, "these coaches allegedly pushed particular managers and advisers on the players and their families." "The picture painted by the charges brought today is not a pretty one," Kim said. "Coaches at some of the nation's top programs soliciting and accepting cash bribes; managers and financial advisers circling blue-chip prospects like coyotes; and employees of one of the world's largest sportswear companies secretly funneling cash to the families of high school recruits." By gaining access to top recruits, Kim said, some of those involved in the scheme sought to control the players and to command cash payments over their choice of a college — and by extension, the apparel they would wear as part of that school's endorsement and sponsorship deal. The charges range from wire fraud and bribery to money-laundering, conspiracy and other offenses. In addition to Person, who is an associate head coach at Auburn University, the arrested coaches include Lamont Evans, an assistant coach at Oklahoma State University; Emanuel "Book" Richardson, an assistant coach at the University of Arizona; and assistant coach Tony Bland of the University of Southern California. Also arrested were James Gatto, Adidas' director of global sports marketing for basketball, and Merl Code, who reportedly has current or former ties to both Adidas and Nike. Another person affiliated with Adidas, Jonathan Brad Augustine, was also arrested. The managers and advisers who were arrested were Christian Dawkins, Rashan Michel and investment adviser Munish Sood. "For these men, bribing coaches was a business investment," Kim said of Dawkins, Michel and Sood. And the big payoff, he said, would come when the young players went pro. Kim quoted Dawkins saying in a recorded conversation, "If we take care of everybody, we control everything — you can make millions off of one kid." The case against the coaches, an Adidas executive and others was built with the help of a financial adviser who was cooperating with investigators, Kim said. The adviser had previously paid bribes to Person, he added. Recounting one conversation between Person and a recruit's family, Kim said that Person "assured a player's mother that he himself had not received a penny for promoting that adviser to her. That was a lie, too: That conversation took place five days after Person had taken an envelope filled with $15,000 in cash from that very adviser during a secret meeting in a Manhattan hotel room." Announcing the charges at a news conference Tuesday, Kim and federal investigators laid out their allegations about two fraudulent schemes: one that revolved around coaches, players and the players' managers or advisers; and another that revolved around people affiliated with Adidas, players and coaches at NCAA Division I universities. The wide-ranging charges include allegations that universities agreed to "provide athletic scholarships to student-athletes who, in truth and in fact, were ineligible to compete as a result of the bribe payments."